Many of you have asked me, “When are you going to give us your opinion on each of the VR headsets you tried at SVVR Expo 2015?” Well, here it is. OlivierJT, developer of the award-winning Synthesis Universe, joins me as I give a complete breakdown, analysis, and comparison, based on my own personal experiences with each of the headsets. I’ll give you a quick breakdown here, but I really encourage you to listen to the podcast to hear the excitement in my voice as I go over each one in detail. I got a chance to finally try Vive at the WEVR afterparty on the first night of the Expo. I have officially jumped onto the Lighthouse bandwagon. The latest Sony Morpheus, with its 120Hz refresh rate and latest software demos also blew me away. I think everyone should get a chance to try out the London Heist experience. With a few oddities in their ergonomics, I would consider myself a fan. Oculus’ Crescent Bay confused me. I had already tried it once at Oculus Connect last year, but somehow, this years version gave inferior results. The lenses felt wrong, as if someone had smeared Vaseline all over them before handing me the headset. I was also encouraged to not wear my glasses. I was a bit disappointed in that. 3D audio was amazing though. OSVR is not a contender in this race. With that said, I truly don’t think it is meant to be. The demos at SVVR Expo were not their latest models, and the concept of open source hardware and software together means that OSVR is still offering something that none of the big guys would even consider. FOVE also greatly confuses me. I still don’t see the value in eye tracking with our current VR headsets, and their calibration system hated me because of my luscious eye lashes. 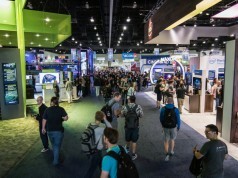 Olivier and I discuss some other fun things that we experienced at SVVR Expo 2015, and I’m sure the conversations will continue to be more and more exciting as we get closer to E3. I want to thank Olivier for being such a good companion on this trip, and for sharing his thoughts with us on this podcast.